Thirty years after their most famous encounter, old foes, or to be more polite experienced adversaries, will once again draw swords as they enter the global table tennis theatre. Sweden’s Ulf “Tickan” Carlsson and China’s Guo Yuehua will both be in action at the Volkswagen 2010 Cup – Guangzhou to be staged in the southern Chinese city on Monday 29th and Tuesday 30th March 2010. No they won’t have to stretch their legs and aching muscles against the likes of Ma Long, Timo Boll and Vladimir Samsonov but they will be as determined as ever to clinch the top prize. They are competing in the Spectacular Pairs event. Ulf Carlsson will partners former Men’s World Singles champion, Jörgen Persson, whilst Guo Yuehua is in harness with the supreme showman, Chen Xinhua. On each day both pairs have a three minute session to show their skills and entertain the crowd, being marked on consistency, degree of difficulty and the spectacular element of their display. No doubt they will do that just as Ulf Carlsson and Guo Yuehua did in 1980 in the Men’s Singles final at the Scandinavian Open in Karlskrona. “I was 19 years old at the time”, reflected Ulf Carlsson. “I won three-two.” The match went the full five games distance; in those days before mobile telephones, internet uploads and ipods, games were to 21 points and singles matches in international tournaments were best of five games. “It was a remarkable year, in the spring we won the Men’s Team event at the European Championships in Berne, Switzerland”, explained Ulf Carlsson. “Against both Hungary in the semi-finals and Germany in the final, I won at four-all; against Hungary I beat Istvan Jonyer then against Germany, I beat Wilfried Lieck.” In 1980 the system of play in the Men’s Team event at the European Championships was different to that witnessed today; it was very simple, three players in a team and nine singles matches. Carlsson’s team mates in those memorable matches were Stellan Bengtsson and Ulf Thorsell, both left handers but very different; Erik Lindh and Mikael Appelgren were the upstarts. They had to sit on the bench and watch! Guo Yuehua reached the Men’s Singles final at the World Championships on four consecutive occasions, in 1977 and 1979 he was the runner up; in 1981 and 1983 he was the winner. The crowd was delirious and Ulf Carlsson responded. “After winning the fourth game, everything I did went right”, smiled Ulf Carlsson. “I was in the zone, I think only twice in my career did I ever experienced that feeling, I remember every point, it was amazing, a fantastic year.” Undoubtedly, it was one of Ulf Carlsson’s best ever performances. Nostalgia but now Ulf Carlsson is looking forward to playing again as his 50th birthday approaches. “I’m nervous about playing in Guangzhou but I’m looking forward to the competition”, concluded Ulf Carlsson. 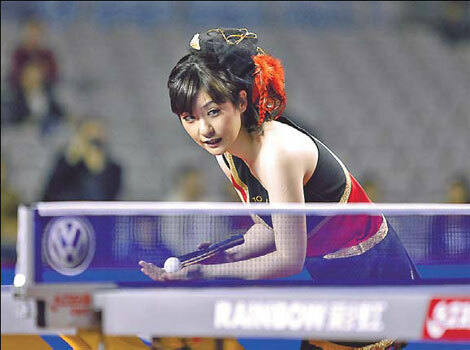 “I’m regularly in the table tennis hall these days but outside the court, not inside; however, I’m preparing! Good preparations and that is what secured victory for Sweden in the memorable Men’s Team final at the World Championships in Kuala Lumpur in 2000 when Sweden beat China in a gripping full distance contest. Jörgen Persson won the vital last match when he beat Liu Giuoliang, the coach on duty for Sweden was Ulf Carlsson; in Kuala Lumpur ten years ago it was unbridled Swedish joy. Ten years later Jörgen Persson and Ulf Carlsson are together again; Karlskrona in 1980 was spectacular, Kuala Lumpur in 2000 was spectacular; so when the year ends in zero on fact is certain from Ulf Carlsson. Ulf Carlsson and Jörgen Persson plus Guo Yuehua and Chen Xinhua will line up alongside Japan’s Koji Matsushita and Hiroshi Shibutani, brothers Jean-Michel and Philippe Saive plus the one female partnership on duty, Hungary’s Krisztina Toth and the Czech Republic’s Renata Strbikova.